Brought back to Europe by Christopher Columbus from his adventures to the New World in 1492, this deep-red, spice gained popularity throughout Spain, and evolved in Hungary through the constant breeding of milder and sweeter strains during the 17th Century. 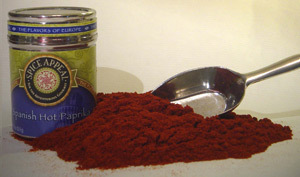 This extremely “hot” pimiento possesses a spice intensity unparallel to its traditional Hungarian counterparts. A favorite ingredient in Andalusian cooking. Add to fish dishes, sofritos, bean soups and sausages. A delicious complement to meat and poultry stews, egg dishes, steamed vegetables, and rice dishes.